Harry's at it again. Susan's fighting the vampire urges after suffering being infected in Grave Peril and won't let Harry help her. Harry's trying to dig around anyway and letting himself go. It's not pretty. Billy the Werewolf (from Fool Moon) decides to step in and help out, by picking things up and ensuring Harry keeps a client. After it rains toads and a botched assassination, Harry thinks his day couldn't get worse, but it's only the beginning. Turns out his client is the Mab, the Winter Queen. Good news, Harry's no longer indebted to his Fairy Godmother. Bad news, Lea sold Harry's debt to Mab and she's willing to settle his debt with him for three favors and calling in her first marker. Someone killed Reuel, the Summer Knight, stole his mantle, and framed Mab. Mab is pulling in a marker by, uh, requesting Harry figure this mystery out. Harry says he'll think it over. As if things weren't bad enough, the vampires of the Red Court are mad as hell and taking their vengeance out on all wizards, primarily Harry, but any wizard will do. They attack a wizard citadel in Russia, which ticks off the White Council. The vampires promise they cease and desist, if the White Council produces Harry on a silver platter. White Council doesn't see a problem with this, but Harry does. They come to an agreement. If Harry can grant safe passage through Nevernever, they'll not turn him over to the Red Court. In short, Harry talks to several of the faeries, takes a look at the crime scene, picks up another case of a missing girl, runs into his ex-girlfriend who he thought had died, figures things out and saves the world. I can rely on Butcher to deliver a good story with lots of action. This one starts off with a bang and doesn't let up. Butcher does a good job at pacing the action by breaking it up with Harry's thought process, explanations, or observations, however, I tend to believe he drags a bit in those areas. 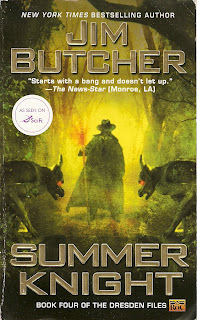 I think the Dresden books are a good writing learning tool for someone to figure out how pacing is done, though I wouldn't take it to the level Butcher does, as he tends to slightly get carried away. I was also glad Butcher brought back some of the other characters. Murphy is pretty much in all the books, Bob made a small appearance as does Mister. But Billy and crew weren't in the first or the third and I'm glad to know they aren't forgotten. Butcher also brought back Toot-Toot, a small pixie who has an insatiable appetite for pizza and who has organized a small pixie army for the impending doom which later play a vital role in the battle. I should be sad Susan's AWOL, but for some reason I'm not. Harry might love her, but I don't. Maybe it's just one of those things. Another question I have for Butcher is, "Do werewolves 'woof'?" I'm inclined to think they don't, but because Billy is a mortal who knows the one spell to shape shift, perhaps his mortal persona takes over and he can 'woof'. "Woof" does still their thunder a bit doesn't it. Nothing very frightening about woofing. Yeah, the woofs took the werewolf image down a notch. However, I hope Butcher doesn't change that if he uses the werewolves again. I like Butcher's humor and I think it's one of the reasons his series is so popular. Oops, I meant - steal, instead of still, duh. I'm definitely going to try this series.